1/35 Japanese Type 1 Model Tank Kit Discounts Apply ! TAM35095 - 1/35 Japanese Type 1 Tank Model. The Japanese Type 1 75mm self-propelled gun was the first self-propelled gun developed by the Imperial Japanese Army during WWII. It used the chassis of the successful Type 97 medium tank with the turret replaced by a Type 90 75mm field gun in an open superstructure. Although the prototype was completed in May 1941, production did not begin until the latter half of 1943 as priority was given to aircraft manufacturing during the war. The self-propelled guns were deployed to Mobile Artillery Regiments and first saw action during the Battle of Luzon in the Philippines in 1944. 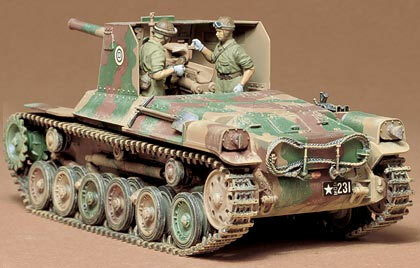 The Tamiya model faithfully captures all the detail in 1/35 scale. 1/35 scale plastic assembly kit. 75mm gun is movable. Gun barrel also enables recoil movement. Kit comes with 2 crew figures.